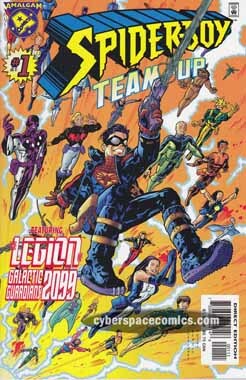 When the DC and Marvel Universes merged in Marvel vs DC, a new one was created: the Amalgam Universe. This one-shot combined Superboy with Spider-Man. During a battle with the Scavulture, Spider-Boy is at the mercy of the villain’s Evil Eye. And, just as the eye’s energy blast is about to hit him, Spider-Boy is trapped within a Time Square and transported to the future – the year 2099, to be exact – by the Legion of Galactic Guardians 2099. They reveal that his memory inspired the formation of their team. He’s been plucked from the past, moments before his death, so they can meet him face to face. But, it’s got to be a short meeting since he can only stay for ten minutes or so before it starts to place stress on the time-stream. Things get bad when the Frightful Five break into the Legion’s headquarters and smash the Time Square Generator. So, our heroes have to stop the Frightful Five and figure out a way to send Spider-Boy back to his own time before a chronal collapse is triggered. And, even then, Spider-Boy is still at the mercy of Scavulture’s deadly energy blast. Sheesh! All this … and the first appearance of Spider-Boy 2099, as well! There’s certainly a lot of time-travel going on in this book but, fortunately, it’s not super-confusing. Ladronn’s art is really channelling Jack Kirby – which seems to work well for this story. Stern & Kesel’s tale is quite in-depth – there’s a lot going on but it’s not so overwhelming that it gets beyond your grasp of understanding. Plus, it was neat to see the way they worked in the origin of Spider-Boy 2099. All in all, it was a fun read but nothing strong enough to make me wish for another one.